Welcome to Today@WKU, the daily newsletter from WKU Public Affairs, for October 18, 2018. 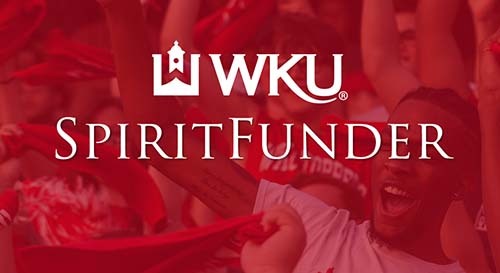 SpiritFunder, WKU’s crowdfunding platform, announces new campaigns: SpiritFunder, WKU’s crowdfunding platform, is relaunching today (Oct. 18) with five new campaigns. Projects featured on SpiritFunder come directly from WKU students, groups and faculty who are looking for more opportunities to learn, grow and achieve. 22 WKU students candidates for Homecoming queen: Twenty-two students are candidates for Homecoming 2018 queen at WKU. WKU will play FIU in the Homecoming football game on Oct. 27. At halftime, the Homecoming Court will be introduced, followed by the crowning of the queen. Kickoff is set for 6:30 p.m. at Houchens Industries-L.T. Smith Stadium. WKU to participate in earthquake drill this morning: The Great Central U.S. Shakeout Drill will take place today (Oct. 18) at 10:18 a.m. local time. WKU will participate in the exercise through the activation of its emergency communications systems, including the RAVE text alert and outdoor warning speakers at 10:18 a.m. CT. Parking Lot and Road Closings WKU Football vs. ODU: On Saturday (Oct. 20), the WKU Hilltoppers will play the Old Dominion Monarchs at 6:30 p.m. Several parking lots will be reserved for event parking and road closures will occur before game time. Women’s basketball: Lady Toppers Tabbed Fourth in Preseason C-USA Coaches' Poll: In the annual C-USA preseason coaches' poll released by the conference office on Wednesday afternoon, two-time reigning C-USA Tournament champion WKU has been tabbed fourth, while 2017-18 regular season champion UAB has been picked as the favorite to win the league. Football: Practice Report: In a high-scoring game last season, WKU Football was able to keep Old Dominion off the scoreboard in the fourth quarter to secure a 35-31 victory. This season - when the Hilltoppers and Monarchs square off on Saturday, Oct. 20 for a 6:30 p.m. kick off - the defense is hoping for more of the same. Logan County Native Named Tourism Chief in Bowling Green: A new leader has been named for the Bowling Green Area Convention and Visitors Bureau. When Sherry Murphy takes the helm, it will be a homecoming of sorts. Murphy is a Logan County native and graduate of WKU. She says that she’s always had an eye on Bowling Green and what is has to offer. Community Conversation at WKU Highlights Robert Penn Warren's Greatest Work: The group Kentucky Humanities is winding down its statewide reading initiative with a final community conversation Oct. 23 at WKU. The Democracy and the Informed Citizen event is concluding the Kentucky Reads project centered around the work of Todd County native Robert Penn Warren, and his Pulitzer Prize winning novel All the Kings Men. After early-season injury, Eckels hopes to help Tops in second half of the season: An offense still lacking any sort of concrete identity is also still searching for consistent play at the quarterback position one week after hoping to rectify that issue. WKU went into Saturday’s game at Charlotte wanting to find reliable continuity at the QB spot. 8:30 a.m.: Differentiation Workshop. Knicely Conference Center. Registration fee is $110; register online. Contact Gifted Studies, (270) 745-6323. 8:30 a.m.: Speech Language Pathologist Fall Workshop: Full STEAM Ahead for Literacy-Based Language Intervention. Knicely Conference Center Regency Room. Registration fee is $50. Contact Continuing and Professional Development, (270) 745-1912. 4 p.m.: Hispanic Heritage Festival. Centennial Mall. Contact Student Activities, (270) 745-2459. 5 p.m. (ET): FAFSA Application Day. WKU Elizabethtown Campus. Contact WKU Elizabethtown, (270) 706-8870. 6 p.m.: L.Y. Lancaster-Hugh Puckett Lecture: An Amazing Adventure by Dr. Todd Cheever, WKU graduate and associate dean of UK College of Medicine Bowling Green Campus. Ogden College Hall Auditorium. Reception begins at 5:30. Contact Ken Crawford, (270) 745-4449. 6:30 p.m.: WKU Basketball Hilltopper Hysteria. Diddle Arena. Free admission; ticket required. Contact Athletic Communications, (270) 745-4298. 7:30 p.m.: Recital: WKU Clarinet and Saxophone students. Ivan Wilson Fine Arts Center Recital Hall. Contact Music, (270) 745-3751. 9 a.m.: Young Adult Southern Book Con. Downing Student Union. Contact Sara Volpi, (270) 745-4502. 12:30 p.m.: Hilltopper TransferMation: Transfer Preview Day. Downing Student Union. Contact Julia Johnson, (270) 745-6481. 4 p.m.: Children’s Theatre Series: Neverland. Gordon Wilson Hall Lab Theatre. Admission is $6; $3 for 12 and under. Contact Theatre and Dance, (270) 745-5845. 5:30 p.m.: Opening Reception for Stickwork at WKU by Patrick Dougherty. Kentucky Museum’s Kentucky Room. Contact Cultural Enhancement, (270) 745-4375. 6 p.m.: WKU Volleyball vs. North Texas. Diddle Arena. Contact Athletic Communications, (270) 745-4298. 7:30 p.m.: Guest Artist: Chrissy Kim, cello. Ivan Wilson Fine Arts Center Recital Hall. Contact Music, (270) 745-3751. 8 a.m.: Head for The Hill open house event. Diddle Arena. Contact Admissions, (270) 745-2551. 10 a.m.: Presentation: Fabulous Fall Inspirations: Creative Ideas for your Autumn Home and Garden by Rickman Freeman, Horticulturist, Baker Arboretum. Downing Museum, 4801 Morgantown Road. Contact Baker Arboretum, (270) 842-7415. 3 p.m.: Children’s Theatre Series: Neverland. Gordon Wilson Hall Lab Theatre. Admission is $6; $3 for 12 and under. Contact Theatre and Dance, (270) 745-5845. 6:30 p.m.: WKU Football vs. Old Dominion. Houchens Industries-L.T. Smith Stadium. Contact Athletic Communications, (270) 745-4298.